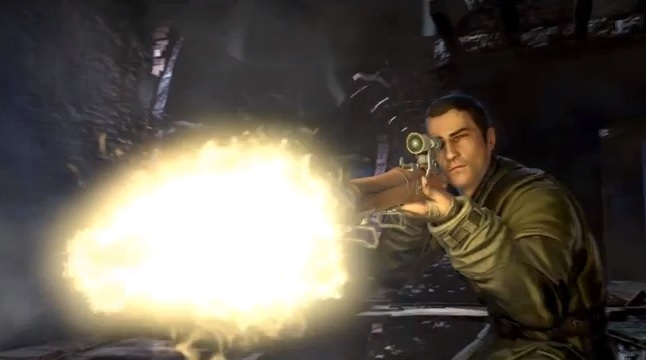 With all the excitement yesterday I forgot to mention Sniper Elite V2 is now available on the Nintendo Wii U. Okay, there wasn't really that much excitement -but someone may have left this fun little shooter off the Co-Op Release alert for this week because the same someone may have made a typo when entering the game into the database. What's the difference between 21 and 31? About ten days. Oh well. Jason and I played the heck out of the Xbox 360 version of this World War 2 headshot extravaganza, and we really enjoyed it. The Wii U version will be similar as far as the basic gameplay in concerned, plus it will have some unique features tied into the fancy gamepad. Take a look at the new launch trailer. The in-game map is nice. Not too sure how much of an improvement the "quick weapon selection" will be, since all you had to do in the 360 and PS3 versions was tap right or left on the D-pad, and the PC weapon selection was pretty standard (fast and efficient and unchanged in shooters since the 90s). I thought gamepad mirroring allowed you to play the game directly on the gamepad and not on the TV, but the video made it look like a new way to view the X-Ray kill cam. Maybe someone a little more Wii savvy can figure that one out. I think a gamepad kill cam is a pretty cool idea, since the co-op mode did away with the majority of the X-ray shots in order to keep the action moving for both players. I would have liked to have seen the gamepad used for a second player to enable local co-op, but that's not the case. That's a shame. Sniper Elite V2 supports two player online co-op. It is available now for the Nintendo Wii U. It has been available for the Xbox 360, PlayStation 3, and PC for about a year. For more information on the core game concepts check out our Co-Op Review of the Xbox 360 version.